Description: The essays in this volume present a state-of-the-discipline snapshot of current and recent research into the Gospels of Matthew and Mark. The contributions showcase wide range of methods and perspectives on Gospels study. The Gospels are viewed from a traditio-historical perspective, and with an eye on history of interpretation. Literary and social-scientific analysis of the Gospels, as well as theological and spiritual readings are also presented. The collection presents chapters by experts in the field of Matthean, Markan, and Jesus studies that freshly examine the core texts. The list of highly distinguished contributors includes: James D.G. Dunn, Francis Watson and Donald Hagner. 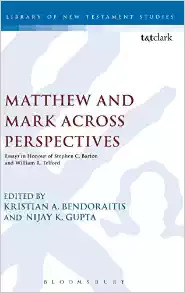 Citation: Gregg S. Morrison, review of Kristian A. Bendoraitis and Nijay K. Gupta, eds., Matthew and Mark across Perspectives: Essays in Honour of Stephen C. Barton and William R. Telford, Review of Biblical Literature [http://www.bookreviews.org] (2019).